An overview of how contact form submissions are handled by Shogun. 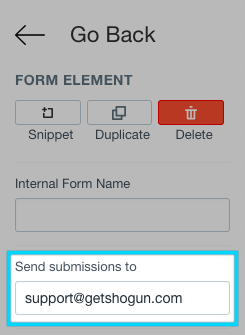 When using Shogun's Form element, there are two ways to view the submissions it has received. Messages from the form are emailed to the address entered in the "Send submissions to" field. The subject line of those messages will also contain the "Internal Form Name," if one has been provided. Submissions from all of your Shogun forms are also stored in the Form Data section of the Shogun dashboard. In this section, you can export all form submissions as a CSV file. The file will contain all of your form data, including the date & time of each submission, the internal form name, and the visitor's email address. Once the "Export to CSV" button is clicked, a CSV of all your forms' data will be generated and emailed to you. If you'd like a form that integrates with your existing mailing list/contact management service or one that offers more complex options, such as file uploads, it is possible to embed third party forms into your Shogun page using the HTML element.